The judiciary and its independence have been a continuous issue at stake in the post-communist Romania. Built mostly on the communist judiciary, which was almost totally subdued to the political power, and without any lustration taking place, the Romanian post-communist judicial system inherited many of the features of the past: a certain inclination for obedience towards the political power, weak independence, internal corruption. Judicial independence was one of the main points of concerns raised with regard to Romania’s accession to the European Union. In 2007, the moment of accession, Romania, alongside Bulgaria, was placed under the European Commission’s supervision through a special mechanism – the Cooperation and Verification Mechanism (CVM) – designed to help the country deal with the core deficiencies of its political system, corruption and lack of judicial independence. For more than ten years – pre- and post-accession – it seemed that the country would comply with the European requirements to strengthen the independence of the judiciary and the anti-corruption measures. It goes without saying that the two strategies had some common points – a more independent judiciary helps the anti-corruption strategy in a country that is almost completely tainted with corruption at all levels of society. Especially in the period 2013-2016, Romania had made a good figure by comparison with the illiberal moves made by other fellow CEE countries like Hungary and Poland. However, in 2017, after the Social-Democrats won the elections of December 2016, the situation changed dramatically and it seemed, from the very beginning, that the main concern of the new power was to diminish the anti-corruption measures, mostly through changing the legislation: the ‘laws of judiciary’ as well as the Criminal Code and the Code of Criminal Procedure, all of which were at the core of the public law that was determining for the progresses acknowledged by the European Commission in its CVM reports along the years. In January and February 2017, the situation reached a peak and the massive protests and strong criticism from European institutions seemed to slow down the process. However, later in the same year, the matter of changing the laws of judiciary has been brought to light by the minister of justice, who released a draft proposal that raised strong debates. The proposal contained, among the most controversial changes: the transfer of the Judicial Inspection (a body endowed with the task of investigating magistrates for alleged disciplinary offences) from the Superior Council of Magistracy under the authority of the Ministry of Justice; the transfer of the management of courts’ budget from the High Court of Cassation and Justice to the Ministry of Justice; the removal of the President of Romania from the authorities empowered to decide on the appointment of chief-prosecutors at national level; a reinforced material accountability of magistrates for judicial errors. Despite strong opposition from the magistrates, expressed within the general assemblies of the courts across the country, and despite an official negative advisory opinion from the Superior Council of Magistracy, the draft legislative initiative was introduced on the Parliament’s agenda by a group of PSD MPs. Instead of following the regular legislative procedure, a special parliamentary committee was created, under the lead of the former minister of justice who, in January 2017, drafted and promoted the famous Emergency Ordinance no. 13. The special committee and the Parliament proceeded, in an emergency procedure pace, to the adoption of the changes to all three laws on judiciary (Law on the Status of Magistrates, Law on Judicial Organization and Law on the Superior Council of Magistracy). During the debates in the special committee, the drafts was amended in several points: the transfer of the Judicial Inspection to the ministry of justice was taken back; the President was kept within the decision-making chain regarding the appointments of the chief-prosecutors, but with a restricted power of decision; a new entity was proposed – an “Integrity Council for Judges and Prosecutors”, entitled, inter alia, to appoint the chief of the Judicial Inspection. Another new creation was a special prosecutorial office for magistrates, separate from the existing Anti-corruption Directorate, which has jurisdiction on all corruption offences and on all public officers, including magistrates. The Superior Council of Magistracy gave a second negative advisory opinion, in which it strongly opposed the creation of both institutions, seen as “serious threats to the independence of justice” and a discrimination from other public officers and dignitaries, who are under the jurisdiction of the general or anti-corruption prosecutors’ offices. Meanwhile, the general assemblies of magistrates all over the country adopted statements against the new changes (over 90% of the total number of magistrates in Romania). The final drafts, adopted in December 2017, removed the proposal on the integrity council, but maintained the special prosecutorial office and the reinforced patrimonial liability for judges in case of judicial error. All three laws were challenged, before promulgation, at the Constitutional Court by the High Court of Cassation and Justice and by the opposition MPs. On 23 and 30 January, the Constitutional Court gave the first decisions on the complaints against the changes to the law on judicial organization and law on status of magistrates and postponed the decision on the other complaints. Although the decisions have not yet been published, it appears from the press releases that the Constitutional Court upheld the creation of the new special prosecutorial office for magistrates as constitutional. It also upheld the partial removal of the President from the decision-making process regarding the chief prosecutors (the President will only be able to decline once the appointment by the minister of justice). In exchange, the Court dismissed as unconstitutional other changes, for lack of clarity and predictability, including the provisions related to the accountability for judicial errors. The President of Romania has not yet exercised his right to challenge the laws at the Constitutional Court, but he still keeps the possibility to do it before or after the Parliament responds to the first unconstitutionality decisions. Almost simultaneously with the amendments on the judiciary legislation, several amendments of the Criminal Code and Code of Criminal Procedure have been discussed in the parliamentary legal committees, without prior public debate. Under the pretext of “implementing existing Constitutional Court decisions” that had declared unconstitutional several provisions of the codes, some of the changes directly or indirectly create a more lenient regime to corruption offences. These draft changes have not been adopted yet, as the Parliament is not yet in session. 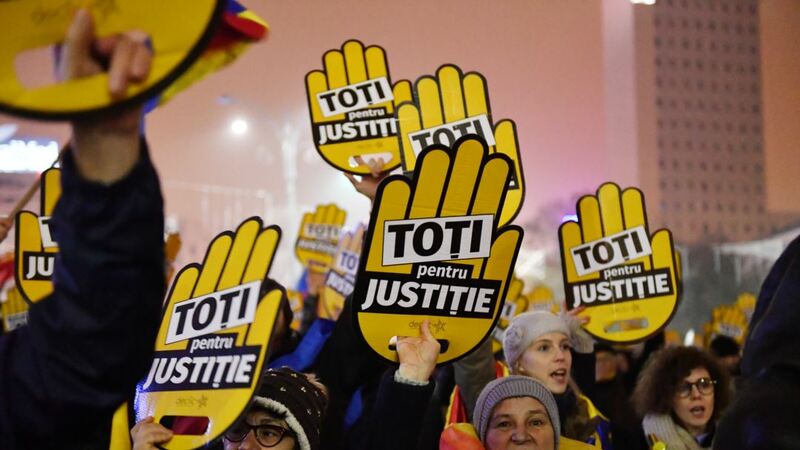 Due to their potential negative impact on the judicial system and on the anti-corruption fight, these changes of the legislation had an unprecedented impact at the level of the civil society: like never before in the last 28 years in Romania, huge protests have started against the ‘assault against the judicial independence’. Awareness has been raised as regards the importance of a truly independent judiciary and the disastrous effects of political corruption on the very existence of a liberal democracy. Internal and external political reactions were also considerable: The President of Romania issued several statements stressing the importance of judicial independence and of the continuation of anti-corruption fight; foreign embassies of EU member states and of the USA expressed concerns related to the new changes; the European Commission issued several warnings against the weakening of the anti-corruption fight in Romania. The Council of Europe, through the Group of States against Corruption (GRECO), expressed its concerns that Romania has not implemented its recommendations in order to reinforce the independence of the judiciary and criticized the way in which the changes to the judiciary laws were adopted. The latest European Commission’s warning is a joint statement of Jean-Claude Juncker and Frans Timmermans, President and Vice-president of the Commission, where they express their concern about potential backsliding of Romania as regards its goals set through the CVM and call “on the Romanian Parliament to rethink the course of action proposed, to open up the debate in line with the Commission’s recommendations.” The statement comes in the context of the resignation of the second PSD Government of 2017 and on “reassurances” from the PSD leaders that the “judiciary reforms” shall continue in 2018. The response of the political coalition in power, through the chairs of the two Chambers of Parliament, was that the Commission was misinformed and that it should read more carefully the new legislative proposals and indicate more precisely which of them are against the independence of justice. In response, the Commission said that she is very well aware about the risks and stakes of the new legislation. Cross-posted with the kind permission of Verfassungsblog and of the author. Original post. SUGGESTED CITATION: Selejan Gutan, Bianca: Failing to Struggle or Struggling to Fail? On the New Judiciary Legislation Changes in Romania, VerfBlog, 2018/1/31, https://verfassungsblog.de/failing-to-struggle-or-struggling-to-fail-on-the-new-judiciary-legislation-changes-in-romania/, DOI: https://dx.doi.org/10.17176/20180131-101044.